Kate McDaniel became secretary, and Kent Chapman became treasurer. Fifty-two people showed up at the meeting, according to Maria Caudill, who convened the gathering as acting party chair. Beginning at 9 a.m., those who showed up were screened to make sure they were registered voters, according to Caudill. The 52 who turned out then elected former Board of Commissioners Chairman Melvin Davis as convention chair, and Davis ran the remainder of the meeting. The first hour of the meeting was officially the precinct convention, in which those present divvied themselves up according their precinct of registration. The county’s 13 precincts are of differing sizes, and the number of delegates is allocated accordingly. None of the 13 precincts had more than the allocated number of delegates, however, and three had none at all. Starting just after 10 a.m., the meeting was transformed into the county convention, and the delegates selected the slate of office holders in secret voting at that time. Gilland is vice president at Piedmont Athens Regional Foundation. She also serves on the county’s Land Use and Transportation Planning Committee and the Stakeholders Committee for the update of the county’s Comprehensive Plan. Perkins is a retired businessman who serves on the county’s Industrial Development Authority and on the Stakeholders Committee for the Comprehensive Plan. Wiedower is a general contractor who ran unsuccessfully in the special election last fall to fill an open seat on the Board of Commissioners. He also is on the Stakeholders Committee. Fletcher is a high school student in the county. McDaniell is a retired government information specialist, and Chapman is an accountant. Sarah Bell, an editor, and Adam Spence, a police officer, also were nominated for the position of party chair. Bill Mayberry, a physician, ran for vice chair. Perkins and Wiedower were not in attendance at the meeting but sent supporting nomination materials. The only elected county officials present were Chuck Horton and Mark Thomas, county commissioners, and Chuck Williams, who represents Oconee County in the Georgia House of Representatives. All of the county's elected officials are Republicans. 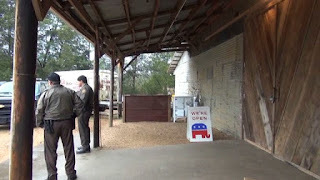 I had planned to observe the precinct and county convention deliberations and arrived at the Cotton Gin at 9:40 a.m.
Two county deputy sheriffs standing at the door told me the meeting was closed but would be reopened at 10 a.m. Two other deputies who were inside subsequently came outside. One of the deputies told me they were off duty. Shortly after 10 a.m. Caudill told me I could not enter the county convention until after voting was complete because I had my camera and party rules prohibit recording of the actual vote. I did not stay and have relied on conversations with Caudill, Bell, Horton and Mayberry for the information in this post. The County GOP is arising from a complete melt-down into action with due haste. Democrats are organized, well funded, active despite being in a minority here, and LOYAL. This is a conservative county in the main. We are glad to see Republicans getting their act together as an organization opposition to thwart the liberal threat. Democrats have their eyes clearly set on Georgia. Tammy Gilland is a great choice. She's genial and genuine, qualities I think are good when working with the opposition party. I'm a little surprised Adam Spence was not chosen. He had a big following on Facebook and promoted himself as a disrupter -- someone who felt the Republican Party was too complacent and needed to change. I feel like that approach to politics is what got Donald Trump elected. But Spence was not a good person to work with Democrats. Tammy I feel is more moderate, which I believe is what our country needs right now. The Democrats have personalities that are further to the left than Tammy is to the right. They too need moderates. There were four Oconee County Sheriff Department deputies there?? What in the world?? If they were off duty, there needs to be a record of payment from the Oconee County Republican Party to the Sheriff's Dept. There is usually a minimum amount of hours to hire an off duty deputy. That payment is going to be in the hundreds of dollars for four deputies. If they were on duty, then we have a major problem. Not letting a journalist in there...that's just petty. And Melvin Davis was "convention chair" and ran the meeting? So much for new blood. If Melvin gets credit for the positives over his sixteen years as Commission Chair, he darn sure needs to take responsibility for the negatives, and there are a bunch. The Calls Creek pipeline, sewage treatment, Lance Haynie's constant waffling, LED billboards, 441 realignment, other road issues, auto dealerships, solar farms, dysfunctional & embarrassing Animal Control board, Frank Bishop (! ), fast food restaurants everywhere, rampant development without a plan, etc. Kinda surprised county Republicans didn't want a fresh start. Police deputies to keep a journalist out, sounds a bit like a police state, rather than a democracy to me. Since the journalist is a registered voter, perhaps he just should have entered as a citizen. Be nervous when those engaged in politics are afraid of cameras. @LetsGoOconee - your comment about not letting a journalist in the room... I'm assuming you're not talking about Lee... Because he is a self-proclaimed social scientist. And his blog is not a journalism project, it is social commentary on current events. Additionally, Lee said he was only prohibited from the voting portion of the meeting, not the entire meeting. There is a good reason political parties don't let cameras in during a vote: freedom from intimidation. It's the same reason a news crew can't follow you into the voting booth when you vote in an election; you have a right to an anonymous vote so you can vote your conscience. I did not show up at 9 a.m. because I did not want to participate in the precinct convention as a delegate. I simply wanted to observe. Other people who did not show up at 9 a.m. also were turned away. Chief Deputy Lee Weems has confirmed that the four officers were off duty and hired by the party. LetsGoOconee, who is Lance Haynie?